A leading Manufacturer and Supplier of Steam Hose Pipe. 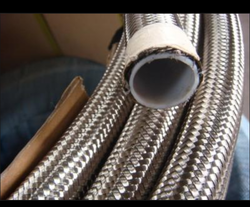 Our product range also comprises of Rubber Mouldings, Rubber Hoses and Industrial Hoses. Offering a wide range of Steam Hose Pipe in different specifications to meet the diverse requirement of client. With high resistance to abrasion and heat, these pipes are widely demanded for several industrial purposes. Our professionals ensure that these durable and high functionality pipes are tested on several quality parameters before handing over to the customers. Recommended for use in steel mills, thermal plants, heavy engineering industries for conveying industries for conveying saturated steam at a specified pressure. Synthetic rubber compound, seamless, reasonably smooth in bore, uniform in thickness and free air blisters, porosity and splits. Synthetic yarn braided or piles of natural or synthetic woven textiles or a blend thereof. Cloth-marked finish, suitable rubber, compound resistant to abrasion and heat.